Groups allow you to see, view and edit information for a single group at a time. This limits information and reduces clutter when you are entering in new data or generating meaningful reports. Groups are set up by your administrator so all you need to do is ensure you know how to navigate between groups. If you want to set up your own groupings, use the Personal Groups Capabilities (discussed in Personal Groups). If your groups are wrong, contact your administrator as soon as possible. When you first login, go straight to the top right of the page and see which group of athletes you are viewing. 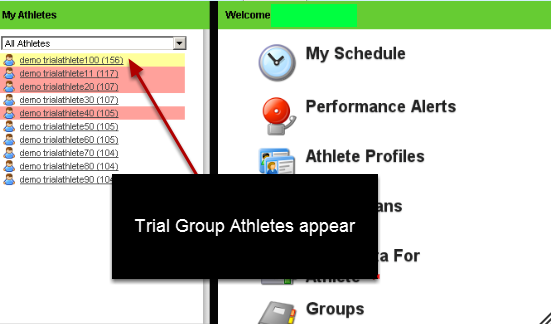 ONLY the group of athletes that is select will appear on the enter data, reports, athlete history pages. You may have access to other groups, so follow the steps below to learn how to change groups. Only the athletes that in the current group that you are viewing appear for you to enter and review data for. 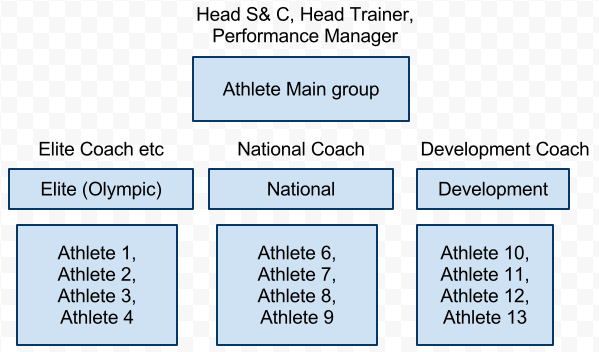 Click on the Groups button, or on the name of the Current Athlete List, to change to a different group and load that group's data. Click on a Group to save the athletes in that group as the current athletes that you want to view. For this example we are going to select All Star Squad. 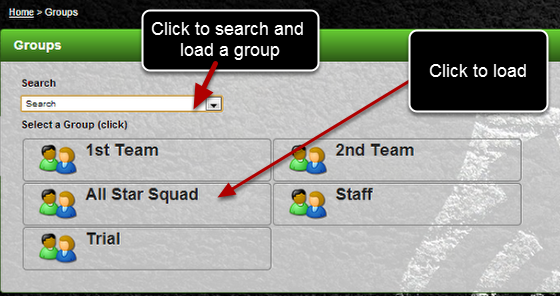 The Squad will load and you can select the entire squad or a subgroup of the squad (as shown in the image 2 steps below). Alternatively, you can use the Search dropdown to see all of the groups/subgroups that you have access to. To load a group using the Search Module, click on the "Search" dropdown. Select any of the groups that appear. When you click on Search dropdown, a list of all of the groups and subgroups that you have access to appears; this includes the number of athletes in the group. If you select a Group from the Search List, that group will appear for you to choose your options for how you want the group to load (see the image in the step below). #4: Choose to load the Medical Team, Premiere or the Reserves subgroup ONLY so that you can limit the number of athletes even further. For this example we are going to select #2; all of the ALL star squad and all subgroups. We click "Save" for that selection. The Group of athletes now appears in "Current Athletes List" and ONLY these athletes will appear in the Sidebar, Reports etc to enter and review data for. The image here shows that the All Stars Squad has been selected and ONLY these athletes will be available. The Group has also changed on the "Current Athletes List". All of the existing modules will allow you to view, enter and produce reports for that group of athletes. 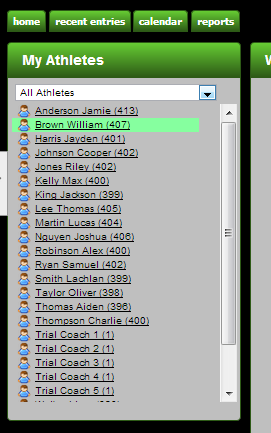 For example, selecting the athletes on the Reports page. 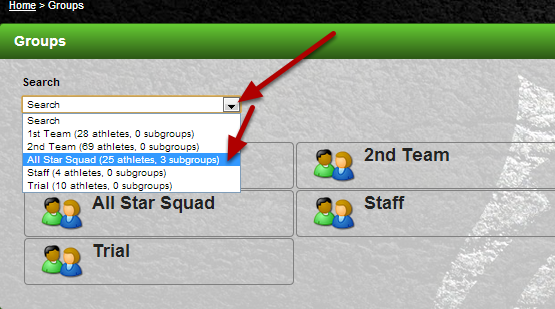 To change groups, click on the groups button and then select a different group of athletes. Just for future reference, if you use the offline installed or offine iPad/iPhone applications, then the most recent group of athletes that you save when you are online will appear for offline data entry.